Hot Topic- Vancouver Election Special « Vancouver Spotlight – Your Station! Your Stories! As of November 15th, the Vancouver municipal elections came to a close, with Novus TV here to supply you with a brief summary of its results in addition to exclusive footage of interviews with three successful city council candidates. Three city council candidates selected to be Vancouver councilors are as follows: for the Coalition of Progressive Electors (COPE)- David Cadman, for Vision Vancouver- Raymond Loule, and for the Non-Partisan Association (NPA)- Susan Canton. In the links below, Alise Mills is here to discuss pertinent issues with each city councilor candidate in the Hot Topic segments. 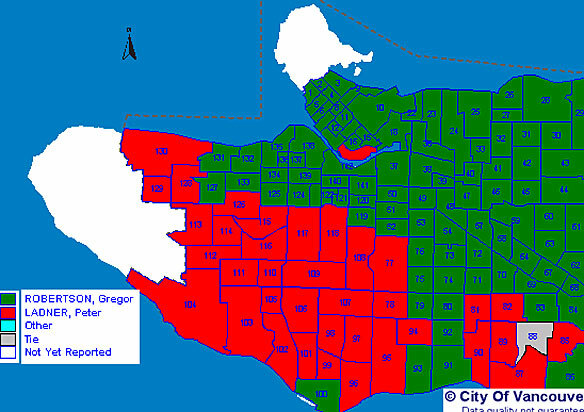 For the mayoral elections, the new mayor of Vancouver, Gregor Robertson, the former NDP MLA for Vancouver-Fairview who left the provincial opposition to run for mayor, took the election with 67,598 votes, a lead of 18,804 over rival Peter Ladner. Mr. Robertson has two major issues to address as mayor- the Olympics, and housing. The link between the two at the moment is the controversial loan of $100 million to fund Olympic Athlete’s housing. Its prospective use afterwards as social housing will, lets hope, effect the thousands of homeless on the streets, a key issue being addressed and the hot topic of his mayoral speech, a sure deciding factor in his landslide victory over the opposition. This entry was written by vanspotlight and posted on November 21, 2008 at 12:31 am and filed under Discussion with tags candidate, david cadman, election, gregor robertson, homeless, hot topic- vancouver election special, housing, kim capri, mayor, mayoral, municipal, olympics, raymond loule, vancouver, vote. Bookmark the permalink. Follow any comments here with the RSS feed for this post. Post a comment or leave a trackback: Trackback URL.